Rather than repeat what's already been done, let me direct you to two amazing sources of information. 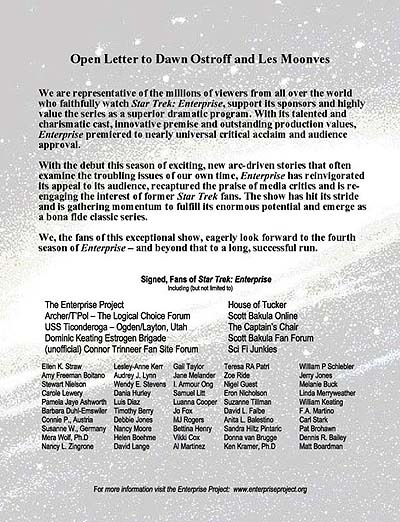 The first site is Support Enterprise at evay's, a collection of everything we Tuckerites have been able to pull together from our many resources. You'll find email links, website links, sponsor information, who to write to at UPN, Paramount and other places, even some sample letters. Get crackin' -- one a week at least. "...everybody watch tonight, and tell everyone else - people on the street. The network is counting on word of mouth! And I'm not kidding, so it's up to everybody out there!" Would you like to find a way to 'tell everyone else - people on the street' about the new season and new direction of Star Trek: Enterprise? Are you wondering how to help raise awareness about our favorite TV show? 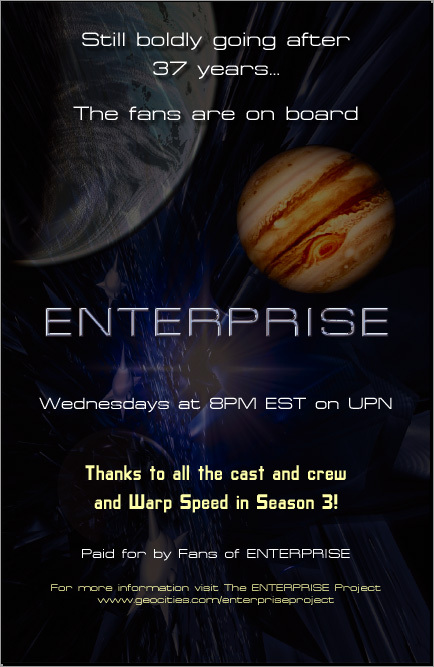 Would you like the chance to positively impact viewership for this crucial third season of Enterprise? The Enterprise Project can help. Our brand new Enterprise bumper stickers will help you support and proclaim that enthusiastic 'word of mouth' about the show! Eyecatching, waterproof and inexpensive, the bumper stickers can be displayed indoors or out - any place you want to generate interest in Enterprise.